The organ for West Vancouver United Church was built by Pasi and Associates of Roy, Washington and installed in the Sanctuary in April, 1998. It was custom designed for the renovated sanctuary to inspire the congregation in the singing of hymns, to accompany choirs and soloists, and to serve the broader community. The organ has 31 stops played from two manuals and pedals, with one manual coupler and two pedal couplers. The organ has suspended mechanical key action and mechanical stop action. The 1851 pipes are arranged in 36 ranks. Most of these are made from a lead-tin alloy, with the wooden pipes made from tulip wood. The case, standing twenty-eight feet high, is made from cherry wood, with walnut inlays. The pipe shades, designed by Janet Lutz, an architect in the congregation, and carved by Martin Pasi, feature the provincial flower of British Columbia, the dogwood. The instrument weighs approximately eight tons. Although the case and tonal design of the organ are reminiscent of historical Dutch and North German instruments, the aim was to create a modern instrument capable of playing a wide range of musical repertoire, and performing a wide variety of accompanimental and solo functions. 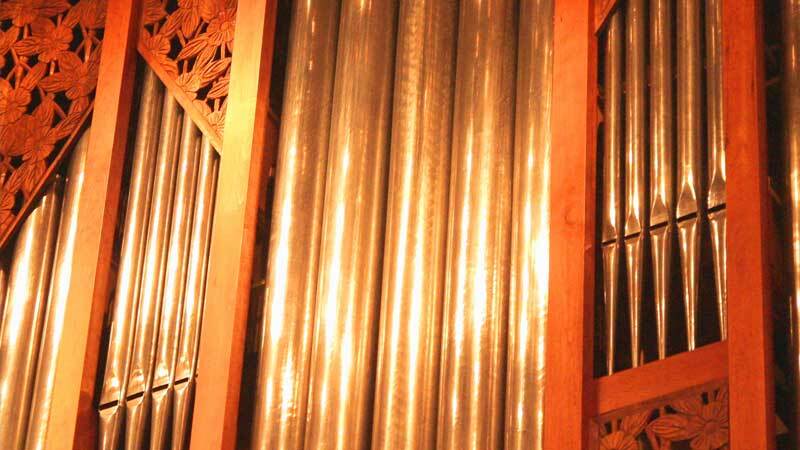 Martin Pasi began his career in organ building during a four-year apprenticeship with the Rieger Company in his native Austria. During his apprenticeship he also attended the Organ Building School in Ludwigsburg Germany. In 1981 he emigrated to the United States and later to Canada to work with various organ builders, finally moving to Washington state in 1986. There he established his own firm in Roy, south of Tacoma, in 1990. Since that time he has built thirteen instruments with his associates. The instrument for West Vancouver United Church is his Opus 10.